Starting from Lake Windermere on Friday morning (5th April), this year’s Flying Scotsman Rally will already have been underway for a day by the time it reaches the Slaley Hall overnight halt on Friday evening just to the south of Hexham. From there, the 92 cars (from the years 1911 to 1948) and crews (from Germany, the USA, Italy, Poland, Belgium and other foreign parts) will head northwards through the village of Greenhead beside Hadrian’s Wall on the B6318 and over the Bewcastle Fells crossing the Border into Newcastleton where there will be a Checkpoint at the Grapes Hotel in the village square. 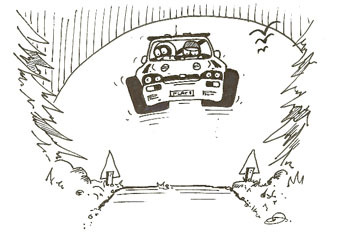 Heading westwards there will be a Test at Lockerbie followed by a second Regularity Section over the hills to Nithsdale for a lunch halt, after which a Regularity Section will head southwards past the Water of Ae before a stop for tea near Gatehouse of Fleet. Two more Regularity Sections will round off the day as the crews head northwards towards Girvan and the Turnberry Hotel for the overnight halt. The final day on Sunday starts with a couple of Tests early on with a Regularity Section across the hills to the morning coffee stop on the coast near Largs. Two more Regularity Sections follow as the cars head out of Largs and northwards across the Clyde towards Drymen and then over the Duke’s Pass to a lunch halt in Callander. The final afternoon run takes in a loop into the southern Highlands to skirt Loch Earn tackling two Special Tests and a Regularity Section on the way to the finish at Gleneagles. 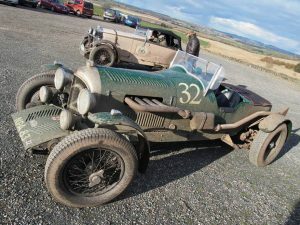 By the way, a certain David Richards Esq will be navigating for Peter Lovett in his 1937 2 litre Frazer Nash BMW 328 – just don’t mention Motorsport UK, eh? The man needs a break!